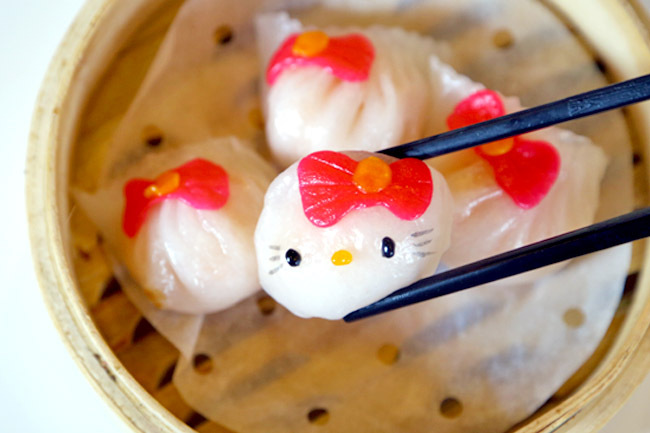 [Hong Kong] The world has seen its FIRST Hello Kitty Chinese dim sum restaurant in Hong Kong. 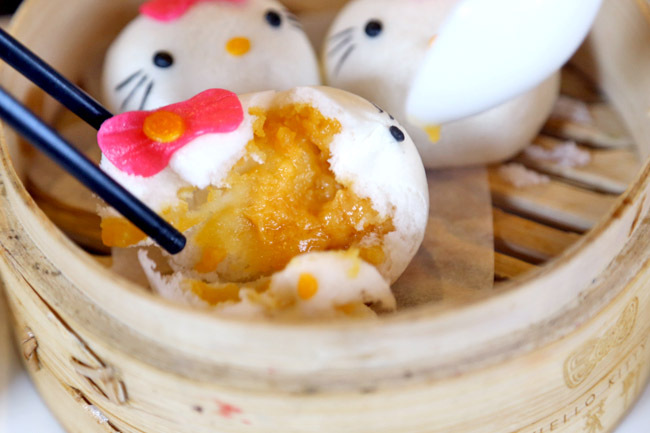 News has gone viral, cute photos have surfaced, and queues have formed… to EAT buns modelled after the world’s most famous cat. Being ‘Dear Daniel’, I couldn’t possibly not join in the Hello Kitty fun. 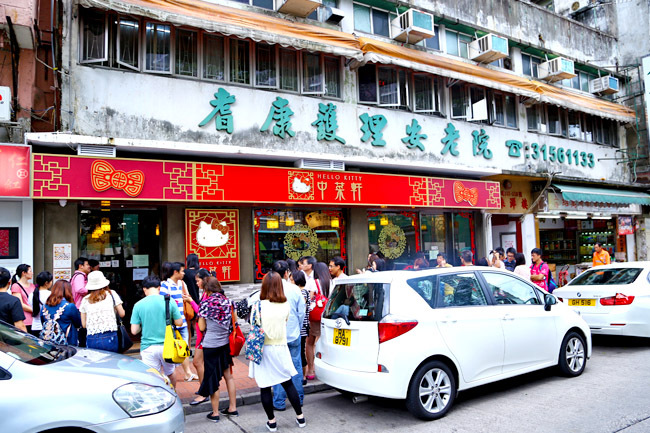 The Chinese restaurant is located near Austin MTR at Kowloon, also about a 10-15 minute walk from Jordan MTR station and the insanely popular Australian Dairy Company. 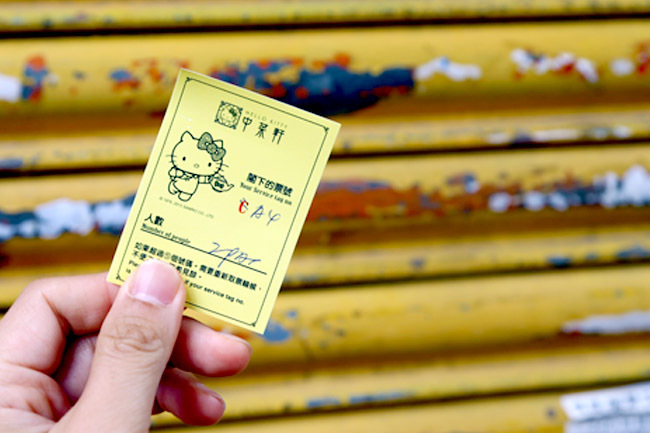 For an opening of 11am, there was already a short queue at 10:15am. If I came at 10:30am, I would have needed to queue round the corner of the block. Tickets will be issued till 3:30pm and 9:30pm for lunch and dinner respectively. 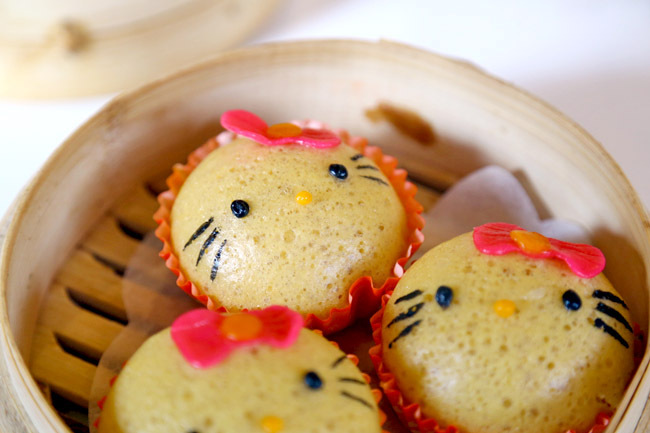 There were 6 Hello Kitty themed dim sum and 6 almost-Kitty inspired Chinese dishes available. 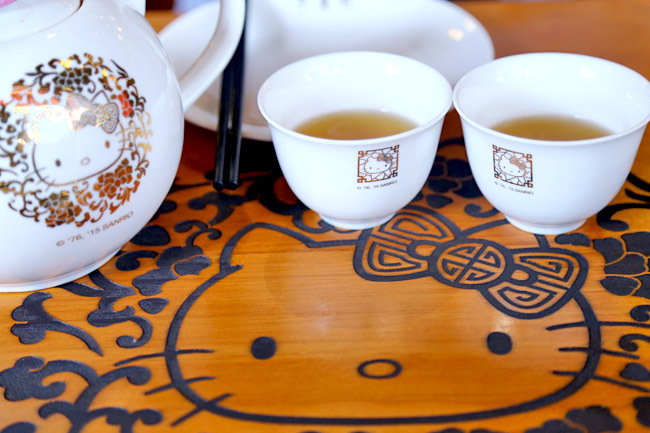 Customers didn’t seem to bother ordering the non-Kitty themed food – the typical Chinese restaurant fare like sweet and sour pork, fried beef slices and vegetables. While we weren’t expecting much from the taste of the food (since some thing’s gotta give), the quality was lower than what we were looking for. 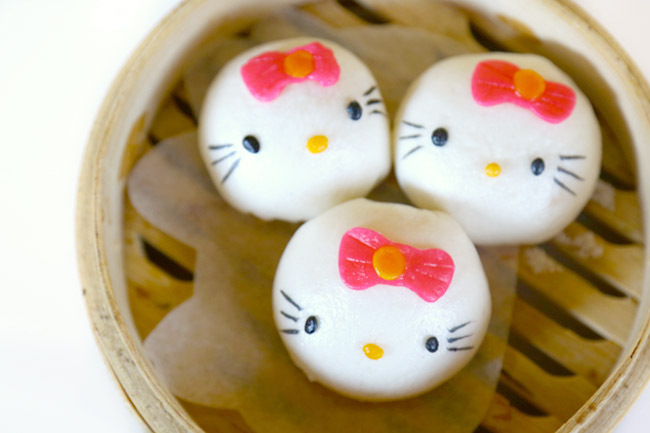 The Hello Kitty faced Liu Sha buns (HK$62, SGD$10.60, USD$8) were adorably cute, we could imagine some fans couldn’t bear to tear them apart. We did, and were disappointed. The salted egg yolk fillings were little to begin with, not the usual fluidly molten, wrapped around by thick skin. 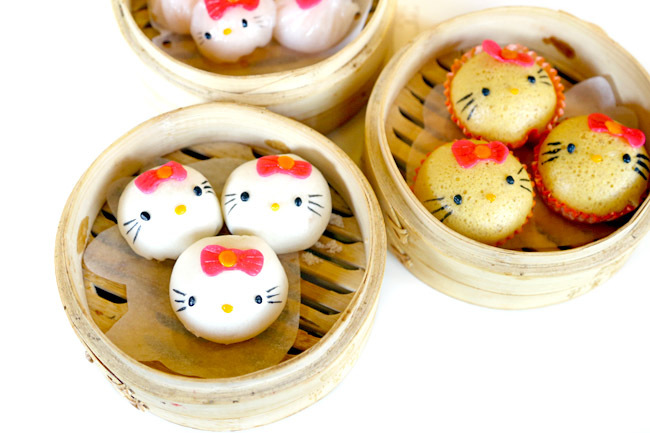 Out of the 4 Prawn Dumplings in the basket (HK$68, SGD$11.60, USD$8.80), only one had the Kitty face, the other 3 with pink bows. The bows were tough. Boo hoo. This Kitty had thick skin. Enough said. 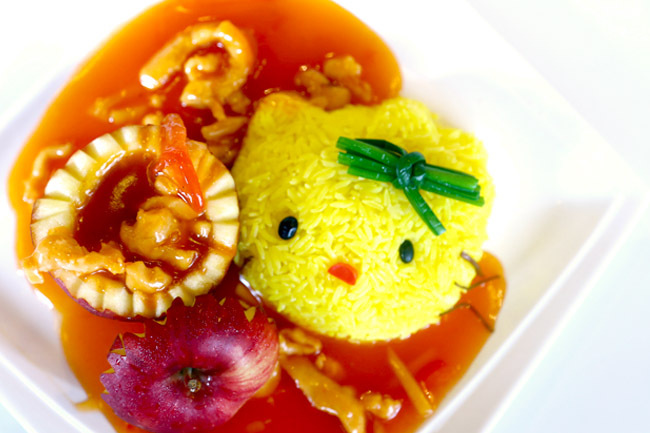 The rice dish, the yellow-faced feline on tomato sauce with chicken strips in apple (HK$108, SGD$18.40, USD$13.90) wasn’t a travesty in looks, but a minor tragedy in taste. Sweet gooey sauce, and non-flavourful rice didn’t make Dear Daniel too pleased. People here looked happy though. Baskets of dumplings were passed around for the ‘pose-with-food’ photo moments. The irony, I think people in general don’t really come to this restaurant to eat-eat. 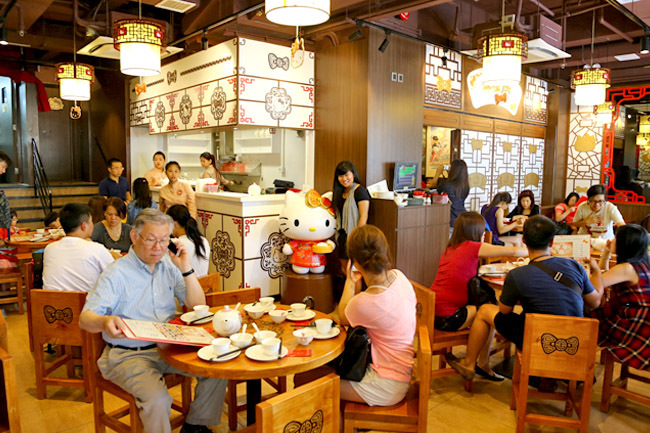 For Hello Kitty fans who don’t mind consuming their favourite idol, parents who would do anything for your excited kids, and boyfriends who need to please your girl. But will be running on tight schedule .. Even after I got the ticket ? :/ how long did u queue ? Hi Cherie, sorry missed this. 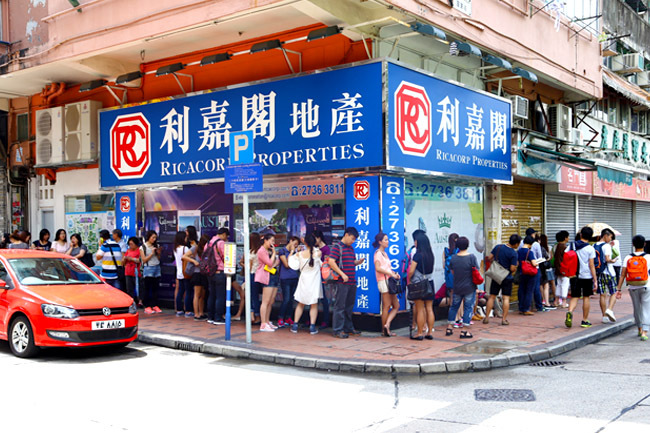 Yes, you still need to queue, but I think it is much shorter now.